We are committed to King Will's credit worthiness and hope all the rings can keep a good condition, so that we provide LIFETIME WARRANTY. But it normally only cover issues that were built-in to product itself, excluding the damage result from buyers themselves. Your tungsten ring requires no complicated cleaning or maintenance procedures. To make a cleaning solution for tungsten jewelry, simply mix warm water with a few drops of mild soap. It is best to avoid using an ultrasonic jewelry cleaner when cleaning tungsten rings. 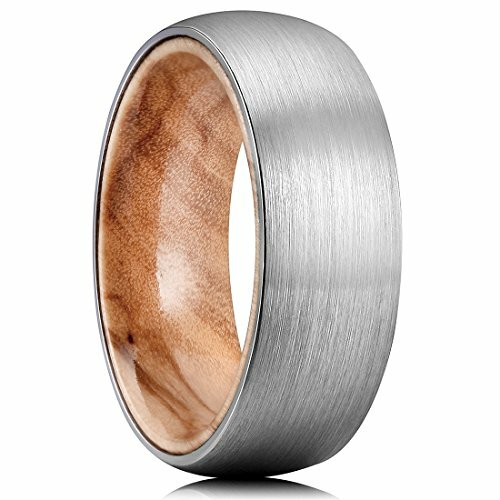 Keep your tungsten ring away from supersonic cleaner, steam cleaner or harsh chemicals which may cause spotting on the surface of the ring. Tungsten Rings are very durable but brittle and can crack under harsh impact. Although rare, dropping the ring onto a hard surface may cause a slight crack to the ring's surface. It is best to store your tungsten ring separately. When taking off tungsten ring, you can place it inside the free ring box and then put the box in a safe space. Measure your finger size before purchase, for tungsten carbide ring can not be resized. The paper measurement is intended for reference only. We would like to suggest you have your finger sized at a jewelry store for an accurate ring size. Genuine Tungsten Carbide&White Oak inlay. Classic arc/round shape design with Tungsten Carbide Brush varnish White Oak maintain the shinny wood for a long time. If you have any questions about this product by King Will, contact us by completing and submitting the form below. If you are looking for a specif part number, please include it with your message.